EAST SAND ISLAND -- From a tower on this spot in the lower Columbia River, Adam Peck-Richardson and Brad Cramer peer at double-crested cormorants almost as far as their binoculars can see. The migrating ocean birds are building nests. Already there have been surprises. On the other side of the island where Caspian terns breed, nature may be re-balancing itself. In the past two weeks, bald eagles and gulls wiped out all 5,000 of this year's nests. It reinforced biologists' goal to disperse the terns to protect the West Coast population and provided a harsher but sooner-than-expected opportunity to see the effects of pushing the birds out. 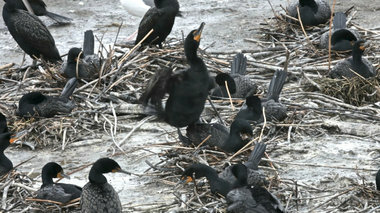 Terns and cormorants are voracious consumers of fish, among them endangered juvenile salmon and steelhead. Shrinking the massive island colonies is part of a complex effort to protect those fish and a larger strategy to keep dams operating on the Columbia and Snake rivers. The Bonneville Power Administration estimates it spent $800 million in 2010 for fish: habitat, hatchery and hydro programs, or lost power purchases when dam operations are restricted -- all to give salmon and steelhead a better shot at reaching the ocean. "The birds have become a significant mortality factor on endangered salmon and steelhead," says Dan Roby, a U.S. Geological Survey scientist at Oregon State University who leads research on cormorants and terns in Oregon, Washington and California. The U.S. Army Corps of Engineers dredged the Columbia River channel in the early 1980s and used the material to greatly expand Rice Island, 21 miles from the ocean. Terns found it ideal for nesting -- flat, bare sand, free of predators -- as their habitat elsewhere shrunk from development. By 1998 the island was home to 16,000 terns who plucked out 12.4 million fish or about 13 percent of the run. Under the Migratory Bird Treaty Act, terns cannot be physically harmed. But over the next three years the corps shrunk Rice Island's nesting area and used hazing and decoys to move all the birds to East Sand Island, another creation of the corps' dredge spoils. Its six acres of bare sand also offered a wider variety of fish from the estuary. Once moved, smolt consumption dropped by 4 million. "It was amazing how quickly they moved," says Roby. "The idea was to keep them moving to places like Willapa Bay, Grays Harbor and Everett, Wash."
Instead, they stopped -- and kept growing. Alarmed, the National Marine Fisheries Service required the corps and the U.S. Fish and Wildlife Service to scatter the terns. In 2006 the agencies announced plans to slowly cut East Sand Island's tern habitat to two acres and build nesting sites in the Klamath Basin, Lane County and the San Francisco Bay Area. Dispersing the big colony would also lessen the impact if a catastrophic event -- predation by other birds or bad storms during nesting. On East Sand Island at the Mouth of the Columbia River, Cormorants and Terns Feast on Endangered Salmon <-- Watch Video at original site.